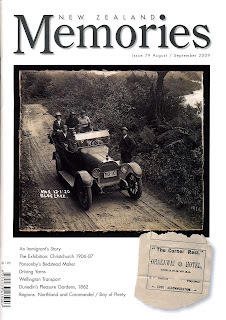 This is the title of an article in the August/September issue of New Zealand Memories magazine by Geoffrey Churchman on his personal experiences of travelling around the Wellington region by tram, bus and train in this period. The article is a follow-on to his new book Wellington Transport Memories which features details on how Wellingtonians generally travelled around their region by various methods from the late 19th century to the early 1980s. The article contains photos for which there was no room in the book, and still more photos that had to be omitted from the book are on the transpress webpage for it. New Zealand Memories is published six times a year and is a must for anyone interested in New Zealand history. A long time Westpac Bank customer, artist Roger Griffiths, was disgusted when it declined an $80,000 mortage application he made on a commercial property in Nelson, even though he had been a customer for 25 years and had paid off 3 other mortgages with them, always on time, and most significantly, had $190,000 on deposit with them. He then told them he was withdrawing his deposit and to make a point, told them he wanted it in $20 notes. They also declined this request and told him to drive around the region to collect it from three branches. However, the presence of a TVNZ news crew apparantly prompted Westpac to rethink this last refusal as the clip showed him with the cash, which he was taking to deposit down the street at the Nelson Building Society. Co-incidentally a current series of TV advertisements from the same bank feature a dimwitted Westpac branch manager who needs to be taught by his school-age son about issues such as pollution, energy saving and community service. One hopes that dimwitted Westpac branch managers generally will get taught about such things. But would such a débacle have happened at other banks? Aspiring bank managers get taught in banking school that all self-employed people are gamblers and bad credit risks and thus banks are usually uncooperative about loans of any kind to them. But surely in this case it ranks as excessive and silly adherance to the policy manual. An appeal to high up in the bank with details of what he would do if they refused could have well have worked. Middle managers in bureaucracies are rarely noted for insight and imagination, but top executives are well aware of the damage this kind of publicity has. A lesson for us all. Video of the TVNZ Breakfast interview. 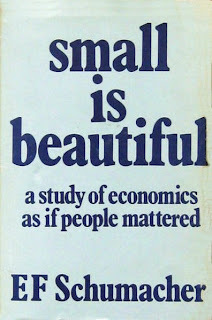 In 1973 British economist EF Schmacher's book Small is Beautiful: A study of economics as if people mattered was published. It challenged conventional thinking of both communist and capitalist worlds that economic growth should be the sole object of life and that "bigger is better". Despite the ideological tussle between east and west in those years, government in the west, including in NZ, had steadily grown bigger, more bureaucratic and strangling following WWII. This changed at the beginning of the 1980s with the adoption of Thatcherism, Reaganomics, and in NZ, Rogernomics, which held that big government was bad for you, but unfettered big business was good for you. Today the world is only too painfully aware that big business isn't good for you either. Globalisation can provide economies of scale, but big business bosses are invariably corrupted by power (whose famous quote about all power corrupting is it?) and greed and expediency takes over -- examples in America: Enron, AIG, Lehman Brothers, Walmart, etc; in NZ: the Australian owned banks, Telecom, etc. There is too much valuable philosophy in this book to be able to do it justice in a sound bite, but do yourself a favour and give it a read. The Bank of New Zealand which now calls itself bnz has lost a High Court case in which the tax resulting from international structured finance transactions was disputed. The case is the first of a series facing the four main trading banks in New Zealand. In total they have been assessed to owe about $2 billion in unpaid taxes and interest. The tax in dispute for bnz, a unit of National Australia Bank (NAB), is $416 million. In addition, as at 30 June, bnz was liable for interest of $238 million net of tax. Penalties have yet to be considered by the Inland Revenue. The is the third time that bnz has robbed New Zealanders, see the post about bnz's behaviour in the 1980s and the subsequent Government bailout; and Google "winebox enquiry". This latest case involved six structured finance transactions with offshore counterparties. bnz made loans to overseas financial institutions at low interest rates. The transactions generated tax losses through fees and hedging costs. The Crown said the transactions were tax-driven and were designed to avoid tax. "Clearly we are disappointed by the outcome," bnz's CEO Andrew Thorburn said. "We will review the judgment which spans 179 pages, and make a decision within 20 working days on whether we will appeal." Although few people like the IRD, there is no doubt that this time the New Zealand public is right behind it in prosecuting greedy pig white collar fraudsters who fleece the public in more ways than one. 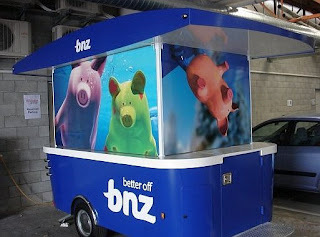 Let's hope the bnz pig dies of Swine flu. The car that is, not the skirt which came about 5 years later. 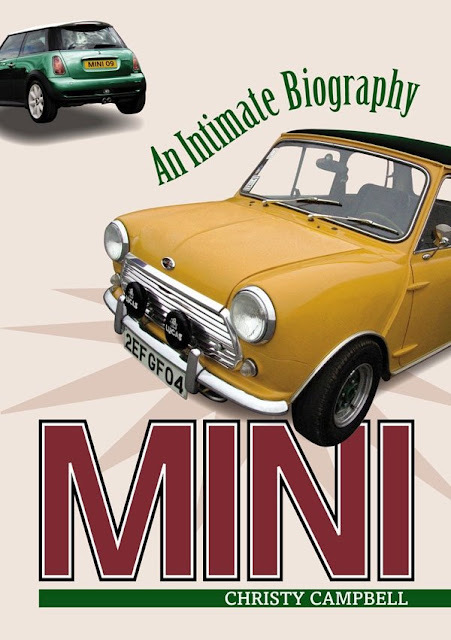 Naturally the occasion is celebrated with books: Christy Campbell has written the above "intimate biography" about the history of the car in the UK, while Penguin in New Zealand has published a book called Mini Down Under (hey you, stop that thinking now, behave!) on its life in New Zealand. 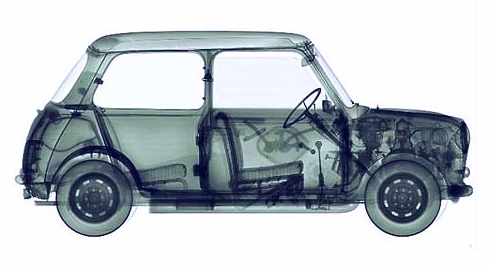 Although as a car it wasn't great (its fuel tank was easily ruptured if you were crashed into from behind, and its small wheels and delicate suspension made it unsuitable for rough roads, despite what rallyists would have you believe), it became an icon of the swinging sixties and an object of fun, as exemplified by Rowan Atkinson in Mr Bean and the NZ feature movie Goodbye Pork Pie. Both books are available from the transpress shop. 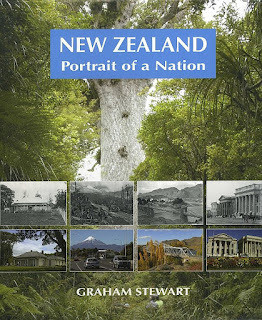 Concluded by remarks that read like a valedictory, New Zealand: Portait of a Nation seems to be publisher and socialite Graham Stewart's final grand slam. The book, while not quite the magnum opus that his End of the Penny Section on the country's city tramways was, is an impressive hardback volume nonetheless. It presents approximately 300 historic monochrome photos taken around New Zealand juxtaposed with equivalent colour scenes today in a roughly 2 to 3 ratio. He comments that "this is not book of pretty sunsets and sunrises"; in fact few of the contemporary scenes, mostly taken by him, would qualify as postcards: often taken against the light or in dull conditions, they are mostly the snapshots of the passing tourist à la Google Streetview. A book like this can't be produced in a hurry and Mr Stewart must have added a few thousand km to his car's odometer plus an equal amount of time spent on research. This very subjective but comprehensive picture of New Zealand yesterday and today is available for $60 from the transpress shop. Although the subtitle and cover suggest that this is a book about carpentry, it is in fact a history of a key part of New Zealand's industrial heritage, something which the Ministry of Culture and Heritage should support, but doesn't. The body text is a personalised account of working in the now closed and demolished workshops by author Keith G. Brown, but manages to also incorporate a record of most of what the workshops did and manufactured. The workshops were a major Christchurch employer and the aerial photo on the back cover shows the sheer size of the plant. Despite the book's subtitle the main raw material used was steel, from which was made numerous locomotives, carriages, wagons and other railway components. Railways workshops were also located in the other main cities as well as in Wanganui. 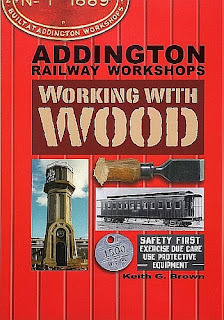 The 112 pages are comprehensive without being overly technical, and contain a good number of works photos, layout maps, as well as railway scenes around Christchurch featuring products from the workshops. Dave Turner's contribution of 16 colour scenes from the 1960s and 1970s significantly add to the visual appeal.